We live in a disposable world. This did not used to be so. "Back in the day" things were made to last, to be repaired and reused. In general this does not seem to be the case anymore. So the question is; what is worth keeping and what should be thrown away? Many, or even most, devices are not specifically made or designed to be repaired but rather disposed of and replaced with a new updated version. This does not mean that they can not be repaired and at least made to work again temporarily. If you can see a future purpose for something then don't throw it away. Simple as that. Well not really. It may seem simple to me as well as to many of you but then again I may not see what you see and vice-versa. When you are about to throw something away take a minute or two to think of some potential future use for it. At the slight risk of becoming a hoarder I have been saving (not hording) a small list of things that I feel may be able to put to use in the near future; also taking into account the little and valuable space I have. 1. Unused cell phone chargers and other power supplies. - Good for certain small projects. Keep an old cell phone and charger as it will always work to call 911 in an emergency. 2. Plastic Bread Bags - I don't keep all of the bags we use but I'll save a bunch and put them in storage. 3. Dryer Lint - I save some of this to use as fire starter. There are other uses that you may collect it for. 4. Newspaper - Lot of uses including as a fire starter. 5. Glass Bottles - re-purposing is the name of the game. 6. Small Appliances - Have some fun and take them apart. Save the parts that may have another purpose. Recycle the rest. 7. Pallets and other wood - for use in making repairs and of course as firewood. 8. Plastic Containers - Durable food grade or otherwise that have a good solid lid. This does not include plastic milk jugs. Save used spray bottles including those used to dispense weed killer and bug spray. 10. Center-fire Ammo Brass - Even though you may not currently reload. 11. Cables and wire - Use for misc projects as well as lashing. 12. Clean used metal food cans - Lots of uses. Keep a small stash and recycle the rest. 13. Bricks, stones, concrete blocks - use as building materials, to build planter boxes and other projects. Please leave a comment and add to this list as to what you have decided to keep around and re-purpose. When the SHTF, as they say, you'll be glad that you have kept these items around. You should realize now, that when the time comes, the list of things you have thrown out daily (whether in the trash or in the recycling bin) and not given a second thought to, will then have a purpose and value. These items could include paper goods, soup cans, milk jugs and other plastic containers and cardboard items. In addition to this list I recommend that you try to fix something that has broken that you would not regularly fix. 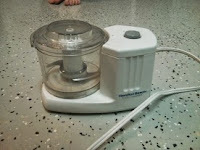 For example, here is a small blender/chopper. It stopped working and I don't know why. 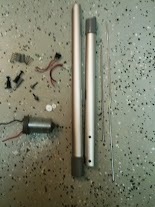 Instead of tossing it in the recycling bin I took it apart and was able to recover some parts that may be useful in the future. I was able to determine that the electric motor was still working but that the method to switch the unit on and off had failed. 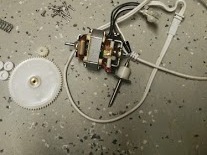 Rather than try to fix the switching mechanism I elected to recover some of the parts instead. 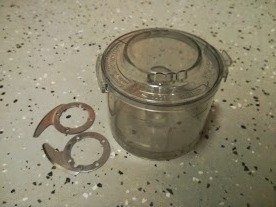 These parts included a small electric motor and cord, a few springs, rubber bushing/washers, container and cutting blades and the screws. Although I am not sure as to what I would use these items for right now these are the parts that I would most likely be able to use to fix another device or for some other purpose. Having skills, such as the ability to repair a small appliance, can be just as valuable as having supplies during a crisis. 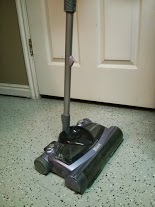 Another lame example is this "Shark" brand rechargeable floor sweeper. The majority of this device gets recycled and I decided to keep only a few parts including the small DC electric motor, a few springs, screws and washers, two electrical connectors and the aluminum handle parts.